NorPlus shampoo is a skin-friendly, gentle shampoo that removes stains to produce an illuminating shine for all coat colours, but is especially good and brightening white coats or socks. 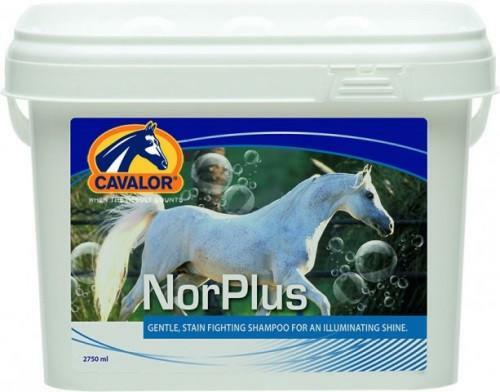 The Cavalor NorPlus shampoo is pH neutral, this means it wont damage the protective lipid layer of the skin- making it ideal for horses with sensitive skin. NorPlus contains a high quality, concentrated cleaning agent so, a little shampoo goes a long way! Not only can you use far less than normal shampoos, but NorPlus also creates lots and lots of foam, which has been proven to improve cleaning action. Horses of all types and colours will be benefit from the deep clean effect, resulting in a beautifully shiny coat. Owners of grey horses, or those whose horses have white legs, find it especially useful because its active ingredient makes white hair noticeably whiter. Instructions: Add 30 ml of Cavalor Norplus to 8 litres of water. Stir until the shampoo is well mixed with the water. Wash horse, and then rinse thoroughly afterwards. The shampoo is very gentle so it is suitable for regular use. NOTE: This shampoo is based on vegetable extracts and as a result it may solidify when exposed to cold temperatures. Simply warm the shampoo, and it will return to its liquid state.